FOX previously had done Grease, which, in my opinion, was superior to NBC’s musicals before it. I was eagerly awaiting how FOX’s next musical might go. I was highly positive. 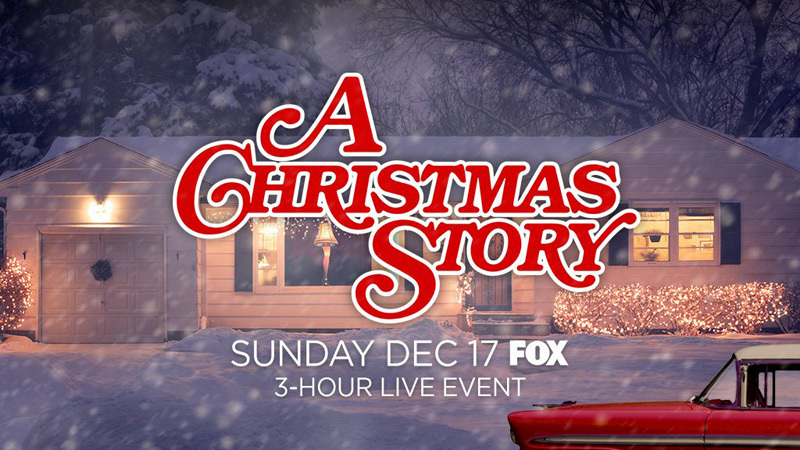 The musical starred Matthew Broderick as adult Ralphie, Maya Rudolph as Mother, Chris Diamantopoulos as The Old Man (Father), with Jane Krakowski as Miss Shields (The School Teacher) and introduced Andy Walken as Ralphie. While NBC upped their game with “Hairspray, Live”, FOX still wins out with incredible staging. The camera movement isn’t fixed and the production makes use of multiple stages. It’s quite a spectacle. The production especially, seemed to even do better with Grease in terms of its production design. It really looked like this was 1940s Michigan. Wow. 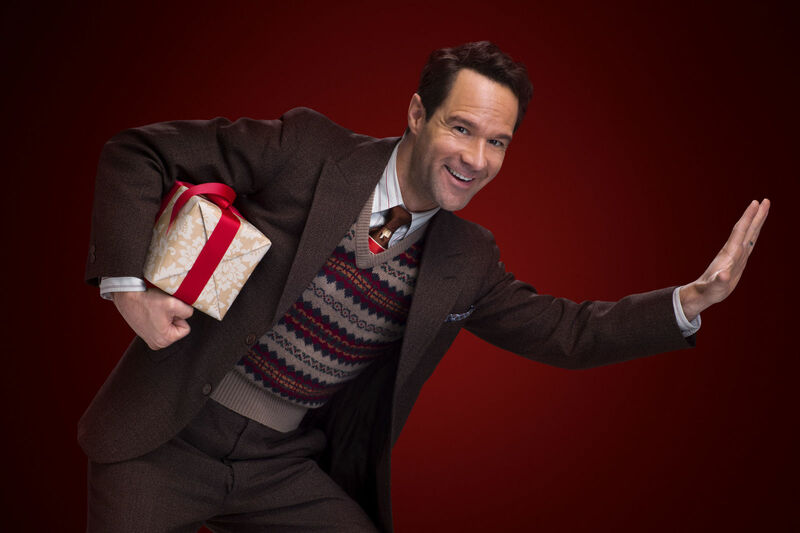 Chris Diamantopoulos: I haven’t heard of him, but, goodness, this man is talented. Impeccable singing, genius improvisational skills, and quite nimble. Diamantopoulos was a scene stealer. Your eyes are glued to him as he plays a stern but kind father, trying to win a crossword contest. I feel like this is an actor that I should be aware of, he blew everyone else away. The Tableau’s : A tableau is when actors “freeze” to make a “picture” before a scene begins. The production made use of tableau’s as they came back from commercial. You’d see what looked like a Christmas postcard, and then it would dissolve to the real environment, as the scene began. It was pretty clever. The Children Ensemble: Fourteen children were selected from all over the country to make up the neighborhood children. These kids are going to go places. They were true professionals. They really shined during a sequence with Krakowski as they tap danced. The clever political jabs: Did you hear Mother listening to the radio and how “Democrats and Republicans still can’t get along?” Or how about when Miss Shields was singing about grizzly bears attacking the candy store? I cracked up. The lighting and sound :Whether it was a magical fantasy or a scary nightmare, the lighting and sound always reflected that idea flawlessly. I jumped back as Ralphie’s parents now had demonic voices during a nightmare. 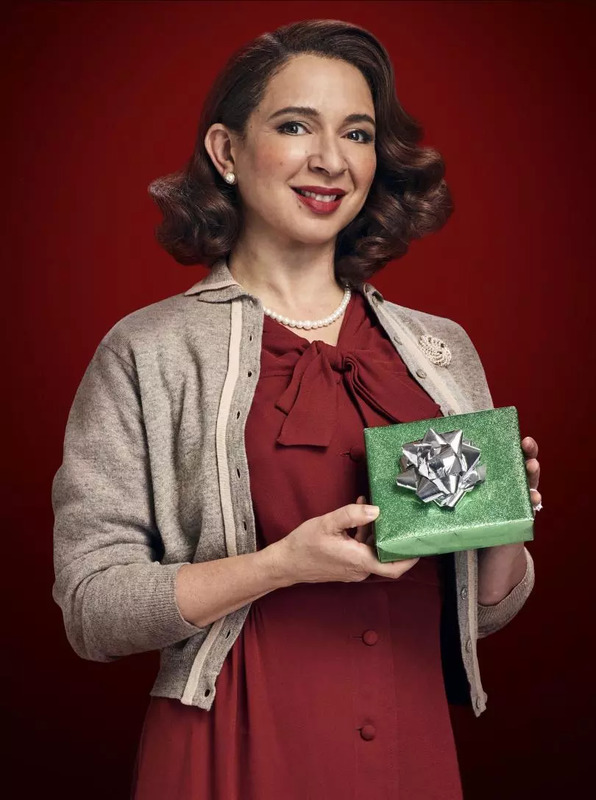 Maya Rudolph: While Rudolph isn’t that great of a singer, she easily falls into the sweet role as Ralphie’s Mother. She has some comedic moments, but mostly, she’s sympathetic, although somewhat flighty. But, where Rudolph misses the mark is when things go wrong. 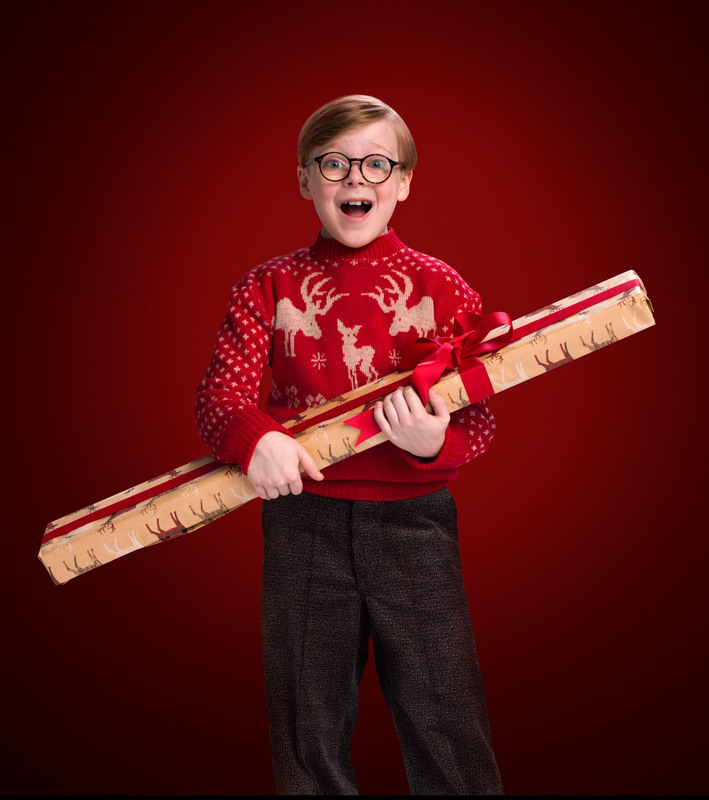 In a scene where Ralphie gets in a fight, his glasses are to have broken. But when they didn’t, she was flustered and “took them anyway.” So, in the next scene, when Mother has replaced Ralphie’s glasses so his father doesn’t get mad at him, the entire scene falls flat due to Rudolph’s “Oh, your glasses almost broke” line. Andy Walken: I don’t feel so great critiquing a young child. But, as he’s meant to be the headliner of this production, there was a major issue with his performance. As he sang, most of the time, he looked angry. It sounds like an overly critical thing or maybe even a joke. But no. He truly seemed angry. I think he was “thinking” about singing the right words, so he couldn’t really think of his facial expressions. Now, he is a young kid, so, the blame can’t fully be put on him… did no one in rehearsal look at all the closeups and think, “Well, gee, maybe we need to work with Andy on his facial expressions?” It really took me out of the production. There were a couple spots where Walken did seem to be in the moment, and these were the few songs where his character is either sad or scared. The Steady-Cam work : This production made use of a lot of steady cam work, but, overall, the camera work was not steady. There were a couple strange zooms, shaky camera movement, and some just plain wirdness. I think this was a little bit camera operator and a little bit director. GREASE had phenomenal camera work. I don’t recall much steady-cam work on that, if any at all, but here, something just wasn’t working right. If I had to grade this exact performance, like Ralphie’s Essay, I would give it a C Plus. It’s not bad, but it wasn’t spectacularly good, either. For every good thing, there was something just a little off. I think FOX had a few glitches with this offering. However, in saying that, I am happy they performed another live musical and I do hope there is another one. If there is absolutly nothing on, sure, put this on. There’s plenty Christmas Magic to see past the coal. In a scene with Diamantopoulos, Rudolph goofed and said “Purkey” instead of “Turkey. ” She started to laugh. But Diamantopoulos began to improvise the second it happened, and turned the flub into a little flirting moment with “his wife.” Rudolph recovered and as she left the scene, Diamantopoulos playfully shouted “Purkey” which had Rudolph giggling a little as she continued on. With all the glasses not breaking, Diamantopoulos saw his glasses fall out of his coat pocket and later get stepped on. But thankfully, they didn’t break, and he used them in later scenes. I appreciated the short “behind the scenes” moments as the show came back from commercial. The dogs used in the production were rescues, the old cars were from collectors and there were crew just out of sight to assist with quick costume changes. NOTE: Photos are not owned by me.